Each year the Perennial Plant Association (PPA), a trade group that works to educate gardeners on great performing perennial plants, selects their Perennial Plant of the Year ©. In 2007, the honor went to the catmint, Nepeta racemosa 'Walker's Low'. Suitable for a wide range of climatic conditions. Readily available in the year of release. Multiple seasons of ornamental interest. Easily propagated by asexual or seed propagation. Nepeta "Walker’s Low" was first introduced in Europe, in 1988. As is expected from a Nepeta, "Walker’s Low" has soft, grey-green foliage, a long, repeat blooming season and few problems or maintenance requirements. The name "Walker’s Low", supposedly refers to a place in England, not its growth habit. ‘Walker’s Low’ can easily reach 2 ½ to 3' tall and equally as wide, in warm areas. It has deep lavender-blue flowers that will bloom profusely in early summer and then sporadically throughout the growing season. If sheared back after the first flush of bloom, another significant bloom can be expected, but your plant will not get as large as it might. Shearing also refreshes the foliage. An aromatic member of the mint family, Nepeta ‘Walker’s Low’ is not attractive to deer. In fact, even cats are indifferent to it. However, it is a magnet for butterflies, hummingbirds and especially bees. 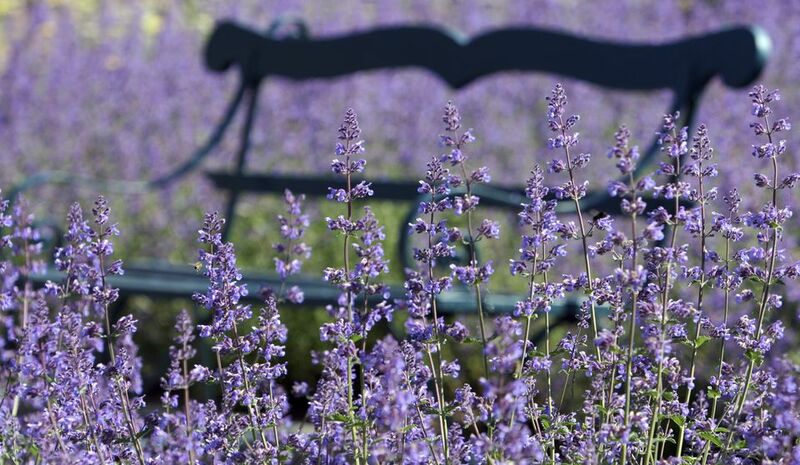 Because of its self-sufficiency and lack of pests and problems, catmint is an ideal perennial for new gardeners. Veteran gardeners are probably already aware of nepeta’s versatility in the garden. One popular use is partnering it with roses to the softening effect it has on hard edges in your garden design.